The 3rd annual Nauset 5K Run/Walk is scheduled for Saturday May 11th. The race will start at 9 AM with a beginning and end point at Nauset Regional High School on Cable Rd. in Eastham. There will also be a free “Kids Fun Run”. The race is sponsored by the Eastham Elementary School Parents Group and was created to promote health and wellness for both adults and children in our communities. The full 100% of the proceeds go to the Eastham Elementary school students. The 5K race route is fairly flat with one short gradual uphill on Old Orchard Rd. Check-in will begin at 8:00 AM and race time is 9:00 AM. The first 100 registrations will receive a Nauset 5K Race t-shirt. The race is sponsored by 'The Black Dog' and the Eastham Police Department. Register online at www.Nauset5K.com. EASTHAM - This is a great house that needs to be seen to be appreciated. This home has been well maintained and is ready to go - 3 bedrooms, 2 full baths, 1st floor laundry, new windows, walk-out basement, gleaming hardwood floors, freshly painted interior, great curb appeal, large 2 car garage, large deck overlooking a peaceful yard and gardens. Perfect home to bring up a young family or to enjoy on weekends. Come see the value! Listed at $339,000. Check out this house at http://180OldOrchardRd.RobertSheldon.com - see more photos, check out the Virtual Tour, and find this home on a map. My May 2013 Report Is Available Now! My May 2013 report is available now! This issue of my newsletter has my first quarter 2013 (1Q2013) Eastham market update. Additionally, there are articles about the municipal water in Eastham and the upcoming Town Meeting. This newsletter has been published every month for over 10 years. My goal, with my newsletter, is to provide accurate sales and market information about the Eastham housing marketplace, to add commentary and opinion (as appropriate), and to keep it interesting. Download your copy of my May newsletter now. It seems to be a sign of impending springtime. 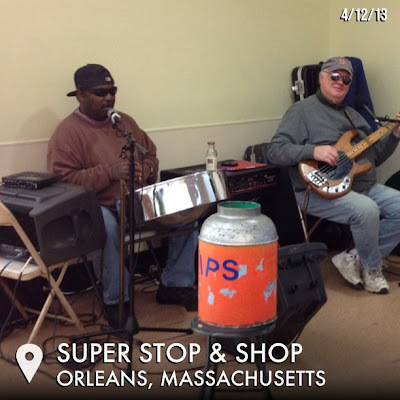 Today's weather was kinda cold and wet, but the steel drum(s) were safe and dry in the entryway at Stop & Shop of Orleans. It was fun to hear a little reggae while shopping for groceries. No woman, no cry! The Herring Have Returned to Eastham! Although it starts as a trickle, later to be a much larger number, the herring have returned to Herring Pond. Yesterday I visited the herring run where it joins the pond and I saw 3 fish in the run swimming toward the pond. I'll keep watch and attempt to see 'lots of fish'. 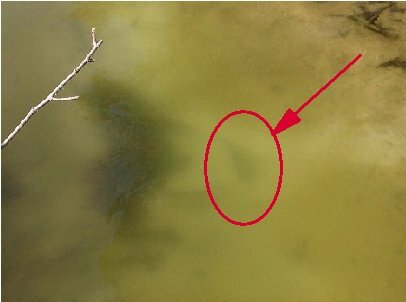 The photo below isn't very clear, but you can see (with the help of a circle and an arrow) a fish. I saw it swimming - I promise. Yeah! 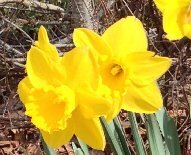 Wellfleet is blossoming again on the weekend of April 12-14 as the second annual Wellfleet Blossoms Festival looks to be bigger and better than ever! Nearly 100 Outer Cape artists ranging in age from 9 to 95 will be exhibiting their work in the centerpiece Emerging Artists exhibition at Preservation Hall and a companion art show, "All About Wellfleet", celebrating Wellfleet's past and present at the Public Library. The theme of this three day festival is "Celebrating Our Emerging Artists" and is a great way to kick-off the season. It starts with a party at the Lighthouse Restaurant on Friday, starting at 4:30 p.m. featuring live music and complementary appetizers. The must-do event of the weekend is a fantastic art show at Preservation Hall including everything from oil painting to sculpture to jewelry, all created by local artists. Kevin Howard, Executive Director of the Arts Foundation of Cape Cod, will be the honored guest to welcome and celebrate the emerging artists at our gala reception at Preservation Hall on Saturday, April 13 beginning at 4:30 p.m. The Town of Eastham has put the applications online for the summer of 2013's beach, shellfish, and transfer station permits. The rates haven't changed from last year. 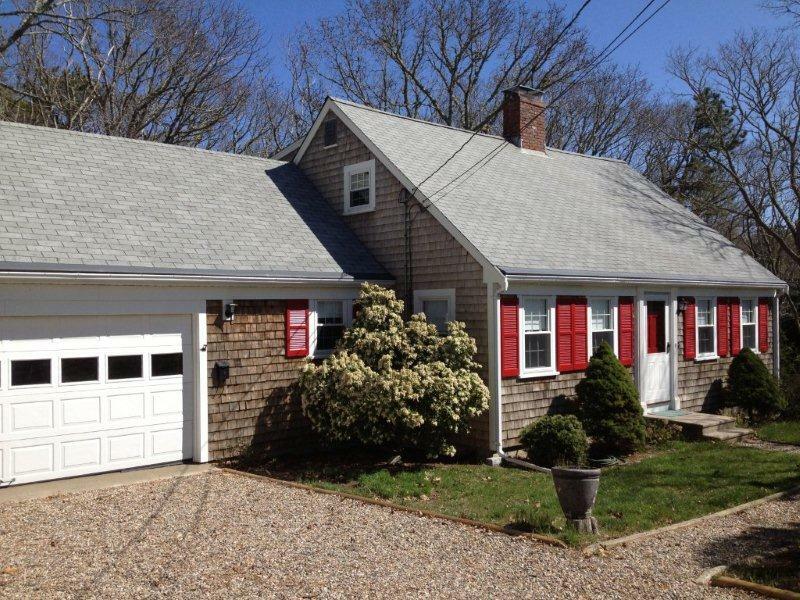 There were 3 homes sold in Eastham in March. The median sale price in March was $343K. 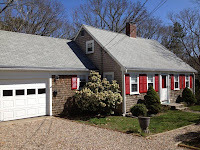 There are currently 102 active single family listings in Eastham (down from 104 on March 1st), with an average list price of $606K and a medium list price of $499K. The average days-on-market is currently 260 days.